Each of the unit’s eighteen LEDs incorporate red, green, blue, amber, white, and UV elements, allowing for an unbeatable level of colour mixing. Not only can the fixture be used to generate rich primary colours, it can also be used to provide warm amber or cool white washes. The inclusion of UV also means that the fixture can be used for dedicated UV wash effects or to generate UV-infused colours such as electric purple and hot pink. While a vast palette of colours can be achieved by mixing various intensities of the six LED elements, to make selection of popular colours quick and easy, the unit is supplied pre-programmed with 63 colour macros. 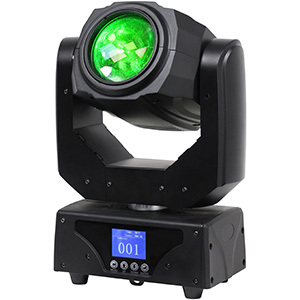 With a 25-degree beam angle, the 18P Hex is equally suited to up-lighting as it is to providing stage or dancefloor illumination. 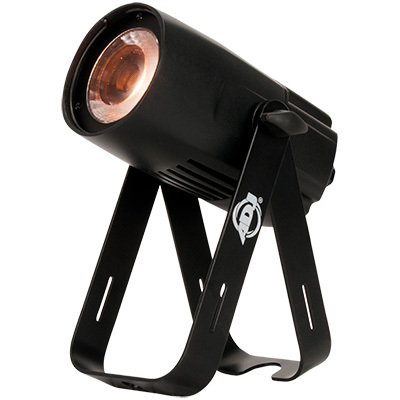 It is provided, as standard, with a removable gel frame that can be used to add in a diffusion filter, in order to soften the light beam, or even a colour gel to achieve a very specific hue. 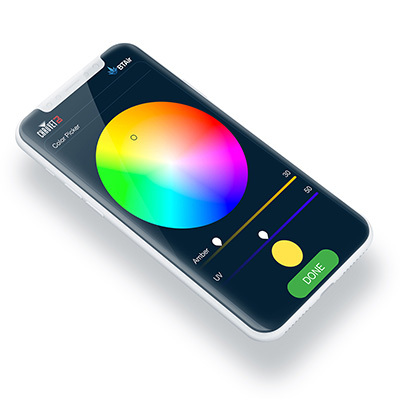 A four-digit LED screen on the rear of the unit, together with four selection push-buttons, can be used to manually select any desired colour by individually choosing a dimmer setting for each of the six LED colour elements. Alternatively, the same interface can also be used to quickly select one of the unit’s pre-programmed colour macros or internal chase programs. 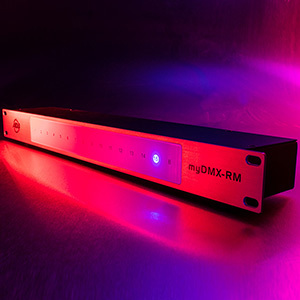 For a simple synchronized lighting system, additional fixtures can be connected using XLR cables and set to ‘Slave’ mode which will caused them to mimic the colour or pattern chosen on the initial (Master) fixture. For simple wireless selection of the unit’s colour macros and internal colour chasing patterns, the 18P Hex is compatible with ADJ’s Dotz Par remote (sold separately). This can be used to control the unit from a distance of up to 25 metres and is also capable of setting a defined chase speed and blacking out the fixture. 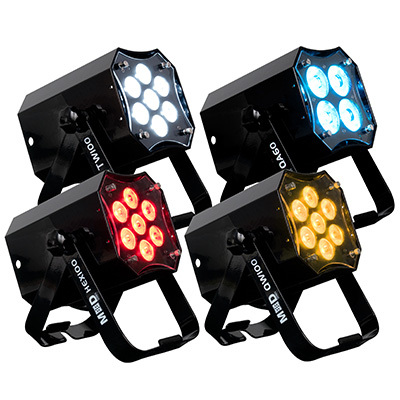 For full control over the fixture’s colour mixing capabilities and other features, the 18P Hex offers four DMX channel modes. 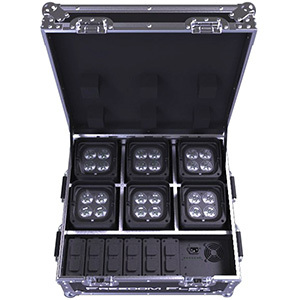 The basic 6-channel option simply provides independent dimming control for each of the LED base colours. The 7-channel mode then adds in master dimming, while the 8-channel option further adds variable speed strobing control. Finally, the full 12-channel option adds colour macro selection, remote access to the unit’s pre-programmed chase patterns, and also selection of the unit’s five different dimming curves. A professional-calibre fixture, the 18P Hex features locking powerCON sockets to prevent loose connections and accidental power disconnection. The inclusion of both input and output sockets for mains power also means that multiple units can be connected to the same power supply, reducing the number of cables needed, especially when lighting is required all around a room. Up to 8 fixtures can be connected from a single 230V supply. Measuring 304 x 174 x 330mm (LxWxH), the 18P Hex is nicely compact, making it convenient to carry, store, and transport. It is also lightweight – at 5.9 kg – especially considering its substantial output power and solid build quality.